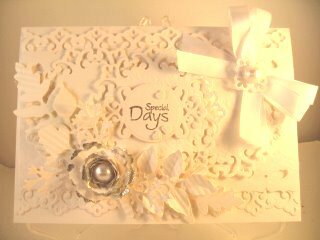 A beautiful Spellbinder Special card that uses the very popular White on White color scheme that is so popular and on trend at present. Both of these cards are one color and use dies from different collections. Some are dies that I have now had for a while but they still continue to give good service as long as they are looked after. Beautiful cards are easy to make with dies and new ones are being added to their collections every month. Once the card is made you can dress it up as you wish. Wouldn't this make a lovely wedding card ? and continued with in the rest of the videos in this series... and many more have been added. Each of these tutorials will show you how to create a card you can be truly proud to send... and delight the recipient in the process. The talcum powder that I have used in the video to degrease the card is just a cheap, ordinary powder that you can buy anywhere... but it not only removes the fingerprints from the card it also makes it smell nice too. And it is cheaper than the anti-static bags that are on sale!! Once the embossing is cool you can always sweep over it with some soft tissue to remove the talc. There will be no end to your creativity once you have some of these wonderful dies and the only limit will be your imagination. But don't just stop at white on white ... think of other occasions that you are making the card for and add in the colours that will suit. For instance ... a gorgeous deep red for a Ruby Wedding Anniversary... or Pearl card for another. Glorious Gold for that special celebration too would make a really spectacular card. Milestones Birthdays too would warrant a really pretty Spellbinder Special card and of course these wonderful dies will always be there to help you with the design. New dies are being added all the time and some of them are very intricate.